All Math Tutors are students majoring in Mathematics, a math-related field or are graduates with a degree in a math related field. Many of the tutors began their academic careers with developmental courses themselves, so they understand the math anxiety and phobias that many students experience. 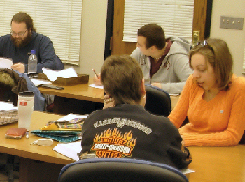 Our first priority when tutoring is to serve the needs of students enrolled in a math course at IU Northwest. However, we also have an open door policy when it comes to the needs of the community. When seeking help in Math Assistance Center it would be helpful if you would organize your questions in advance as much as possible, and be prepared to show your own homework attempts. You will be required to sign in using your student ID upon entering the lab. If you have any questions or issues, please contact Kristie Gilmore, Math Assistance Center Supervisor at 219-981-5691.